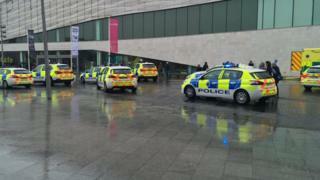 A man has died falling from an atrium at the Museum of Liverpool, police have said. The venue had already opened to visitors when the 38-year-old man fell from the second floor at about 11:00 GMT. Emergency services attempted to resuscitate him but he died at the scene. The death is not believed to be suspicious, police said. The museum has been shut for the rest of the day. A woman who suffered minor injuries was taken to hospital, North West Ambulance Service said. Ch Insp Jason Crellin, from Merseyside Police, said: "There were a number of people, staff and visitors in the museum at the time and they are assisting with the investigation. "We understand that this is a distressing situation for both staff and visitors, who may have been traumatised by the incident and they are advised to contact 111 or their GP for support." Police said post-mortem tests would be conducted. The man's next of kin have been informed but formal identification has not taken place. The museum, which opened by the River Mersey in 2011, is one of the city's most popular attractions, drawing more than 820,000 visitors in 2017-18.